← Individual Self: Who am I? Salutations are to that Shri Guru who opened the eye of a blind due to the darkness (cover) of ignorance with a needle coated with the ointment of knowledge. Guru is a Sanskrit word which literally means teacher, heavy and big. In the Indian spiritual context, Guru means a Spiritual Guide or a Mentor. He provides the Highest Knowledge of Ultimate Reality. Esoteric meaning of Guru is: the person who dispels darkness of ignorance with light of knowledge. Gu means darkness and Ru means remover. How wonderfully the above prayer summarizes the meaning! It is getting very cryptic and abstract now! Sorry, we do not understand this. Can we discuss? Of course! this article is meant for that. We understand your feelings. Let us take a plunge! What is the light of knowledge? All of us came from the single source called Universal Self (also called the Ultimate Reality). Our Individual Self(atma) belongs to that source. Our Individual Self is as powerful as the Universal Self, just like spark having power as that of fire! Realization of this power and union with Universal Self is the real goal of yoga and the purpose of human life. This knowledge is the light. What is ignorance or darkness? Absence of above said light of knowledge is darkness. Why does Guru help? Why is his help important? Guru is embodiment of knowledge, spiritual power and compassion. He removes darkness to help us realize the Ultimate Reality out of his kindness. The veil of ignorance is very strong. So, we need the Divine Force in the form of Guru’s Grace to overpower it and see the light. Guru kindles the lamp in the heart of his disciple from his glowing lamp of spiritual power. Guru is nothing but grace bestowing power of divine itself! i.e., Guru is the means (for realization). What is special about Sadguru? Sadguru is a God-realized Master who is Brahmanishtah, i.e. one who is always established and connected to the Brahman(a.k.a. Universal Self). 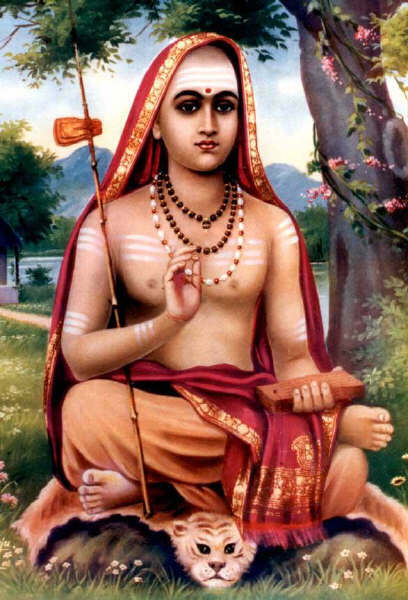 He has a unique power to bestow the Divine Grace to invoke spiritual energy in a disciple. This Grace bestowing power should be commanded and transmitted to the Sadguru by his own Sadguru. Another important quality of Sadguru is that he must come from a lineage of Realized Masters. Sadguru protects the disciple from all dangers and guides him throughout the path to realization of the Self. Transmission of spiritual energy from Guru to disciple is called descent of Power (descent of Grace) or Shaktipat . It is the Sadguru‘s Grace that awakens Divine Mother Kundalini and initiates the disciple into Kundalini Yoga. Why should we remove darkness and get enlightened? Good question. As long as we are in darkness, we do good or bad deeds and get fruits of our actions. These fruits will come back and haunt us! They will inject us into an infinitely continuous and endless cycle of birth and death. This leads to suffering. Once we get the light of knowledge, it will put us on the right track towards liberation or moksha from the infinite cycle of birth and death. Achieving liberation from cycle of birth and death is the highest and the single most important purpose of human life. Guru is our map as well as guide in that mission. Fine. I understood the importance of Guru now. Practically, where can I find the right Guru these days? Good question, indeed! You don’t have to look for the Guru. Shri Guru will find you when you are ready! So, prepare yourself first by regular spiritual practices as prescribed by our scriptures such as devotion to God, prayers, chanting the name of God, showing kindness to animals etc. There is a saying: Guru will appear as soon as disciple is ready. It is important that you get qualified first, so that you can be eligible to request the kind Grace of Shaktipat from these Great Realized Masters. All the best to start your exciting journey towards the Ultimate Truth! Let noble thoughts come to us from everywhere!! For a detailed discussion, read an article here. If you are our new guest to Rudraksha Yoga, we strongly recommend you to go through About, FAQ and Our Policy pages, before exploring the blog further. If you have any questions or feedback, feel free to contact us. This entry was posted in Meditation, The Pillars of Yoga, Yoga and tagged birth and death cycle, do we need guru, guru, ignorance, liberation, light of knowledge, meaning of guru, moksha, role of guru, sadguru, shaktipat, spiritual guide, spiritual master, spiritual teacher, spirituality, the meaning of guru, what does guru mean, what does guru mean in hinduism, what is ignorance in hinduism, what is ignorance in yoga, what is the meaning of guru, what is the role of a guru in hinduism, what is the role of guru, who is guru, who is sadguru, why do we need guru, why do we need spiritual guru, why do you need a guru, why we need guru. Bookmark the permalink. As explained in the article, having one Sadguru(realized master) is the best and all that we need. We need to be very fortunate for this. Taking help of a good spiritual Guru is the next option. If we cannot find one, we can pray the almighty to guide us. The divine power will definitely help us to have the grace of a Guru when we are ready. For all normal beings, like us, it is mandatory to have a Guru. If the person is highly spiritually evolved by birth, he does not need a Guru. He can guide himself! As mentioned, some powerful spiritual practices such as Beeja Mantra Japa, Kundalini Yoga, Srichakra Sadhana etc. should only be practised under close supervision of Sadguru. Otherwise, it is risky and may be extremely harmful to the practitioner.